ANIMAL HOSPITAL : Blue Cross, Sarnia, Ontario, Canada . 208,209 tartar as above . No apparent gingival pathology . 406,407,408 - very light tartar gingivally . some stains on 309 . 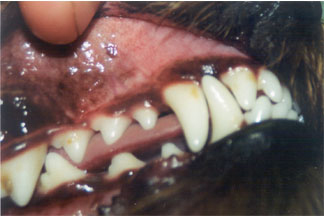 Not much change in these teeth but owner reports has been hard to treat so may not have gotten adequate treatment . On Leba III but no compliance. REMARKS: Tartar on gum line 104,108,109 . Bit of tartar/stain gum line 204,208 . 108 - about 60% tartar covered except mesially . 204 - 30% tartar covered . 205,206,207 - tartar over 30% of tooth surface . 208,209 - 50% tartar covered except 208 on mesial aspect . 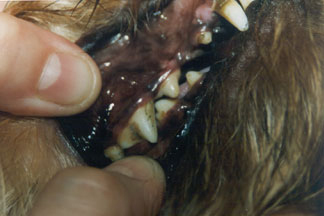 304 - tartar on gingival margin . 05,306,307 - about 70% tartar covered . 308 - 50% tartar covered . Jessie was on placebo twice a week . some tartar - interdontal area . 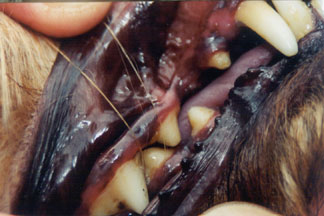 404 -tartar extending over mesial surface . 405 - missing . 204 -60% tartar covered . 207 - 30% tartar . 208,209 - 70% tartar covered . 306 - tartar on gum line . 307,308 - 50% tartar covered . REMARKS: Tartar on distal surfaces 102,103 . Tartar mesio - gingivally on 107 . 109 - 75% tartar covered . 50% of distal surface of 203 . Tartar - mesio gingivally and on distal aspect of 204 .
mesially and over the entire distal aspect . 209 - 75% tartar covered . 403,405 - missing . Plaque or stain on gingival margin 407,408 .
stain over 50% of tooth surface . Show not much change - possibly slightly more tartar visible . Molly was on placebo twice a week. REMARKS: 103,503 - retained primary tooth . 105 - 75% tartar . 107 - stained . 108 - tartar as above . 109 - 70% tartar covered . Spots on 401,402,403 . 404 - 50% tartar covered . Light tartar on 407,408,409 .
primary tooth that is rotated . 301,302 - tartar interdontal . 303 - tartar on gum line . 304 - some stain over lower 30% of tooth . 306,307,308 - tartar on gum line . 309 - staining on both sides of tooth . 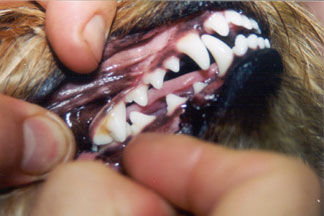 rotated , may be retained deciduous teeth . 04 - 50% tartar covered , less so labially . 105,107 - tartar covered . 108,109 - 75% tartar covered . 202,203 - spots of tartar more extensive on 203 . 204 - 30% tartar covered , greater on distal surface . 205 - tartar covered . 206 - missing . 207,208,209 - 60-75% tartar covered . Spots of tartar on 402,403 . 404 - 30% tartar covered . 405,407,408 - have light tartar over entire surface . 409 - light amount of tartar gingivally . Tartar interdentally 301,302 . Spots of tartar on 303 . Stain and light tartar gingival aspects of 304 . Light tartar over most of the surface of 305,307,308 . Light tartar and plaque on gingival margin of 309 . Show increase in amount of tartar - especially 107 & 108 . Sydney was on placebo twice a week . ON LEBA III PRODUCT DAILY SINCE MARCH 3/95 . gingival tartar and stains on 104 . 409 - stain & light tartar on mesial aspect . Light staining on 309 gingivally .